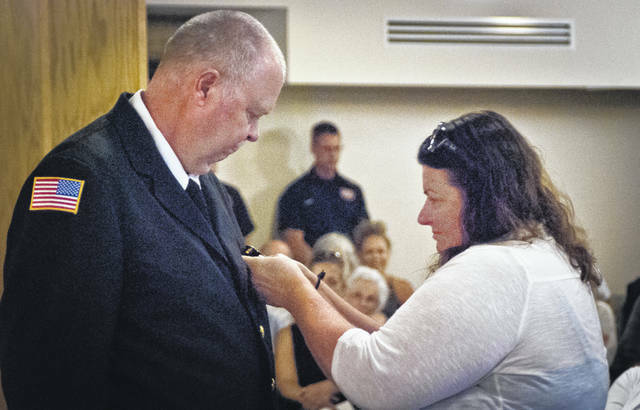 Before her husband, Clyde “Butch” Vanhoose, was sworn-in as Orange Township’s fire inspector, Catherine VanHoose pinned his badge to his dress uniform jacket. Before the board of trustees, family, friends and residents Saturday, new and promoted firefighters from the Orange Township Fire Department were officially sworn in by Chief Matt Noble during a celebratory ceremony held at the Orange Township Hall, 1680 E. Orange Road, Lewis Center. According to Amanda Sheterom, human resources manager, Noble was appointed fire chief in 2014. During the ceremony, John Kopke’s daughter, Firefighter Katie Kopke, gave him one of the proudest moments of father’s life when she asked him to pin her badge on her uniform just before taking the oath of office as a new full-time firefighter. “We’re very proud,” John Kopke said about his daughter. Katie Kopke recently become engaged to Zack Townsley, a City of Columbus police officer. “We have a lot of comradery together,” she said. Trustee Debbie Taranto said it was her first firefighter swearing-in ceremony. Trustee Ryan Rivers was escorted by his daughter, who was wide-eyed and attentive to the ceremony going on before her. James Chappel, Cory Conrad, Forrest Dill, David Grover, Nicholas Leidheiser, Nicholas Renzetti, Zachary Rikk and Jake Stimmel were sworn in as part-time firefighters, as were the following who were either on duty or could not attend the ceremony: Brandon Harm, Johnatan Highley, Cody Johnson, Michael Kemmerling, Matt Kokas, Justin Murphy, Marcus Musser, Adam Parsons, Jarrad Reese and Shea Schuette. Clyde “Butch” VanHoose was sworn-in as the township fire inspector. Full-time firefighters sworn-in Saturday include Stephen Baker, Bradley Belville, Craig Collins, Doug Dewart, Adam Ison, Katie Kopke, Josh Loney, Chris Mize and Trever Murphy. Rachel Peters was unable to attend the ceremony. Those promoted to lieutenant and sworn in were Ken Brooks, Joe Line and Andrew Sapp. Promoted to captain and sworn in were John Hodges, AJ Miller and Scott Rice. This entry was tagged D. Anthony Botkin, Debbie Taranto, Firefighters, Lisa Knapp, Matt Noble, Orange Township Fire Department, Ryan Rivers, Swearing-in. Bookmark the permalink.